Step 1 Bring a large pot of salted water to a boil. Have ready a medium bowl filled with ice water. Blanch the bok choy for 1 minute. Use a slotted spoon to remove the bok choy and place it immediately in the ice water. As soon as it is cool, remove and drain it thoroughly on paper towels. Cut it crosswise into 1/2-inch slices. Reserve. Step 2 Using the same pot of boiling water, cook the fresh udon just until the water returns to a boil, about 1 minute. If using dried udon, cook until al dente, about 10 to 12 minutes. Drain the noodles in a colander and rinse under cold water until cool. Drain thoroughly. Step 3Combine the udon, bok choy, green onions, basil and chicken in a large bowl. Toss lightly to combine. Step 4Mix together the ginger root, soy sauce, vinegar, sugar, sesame and vegetable oils and pepper to taste in a 1-cup measuring cup. Add the dressing to the udon mixture and toss to mix. Serve immediately. In Recipes-list.com we have selected the most viewed recipes from category - Grilled Quick and easy Salads . Enjoy the best recipes specially selected for you! 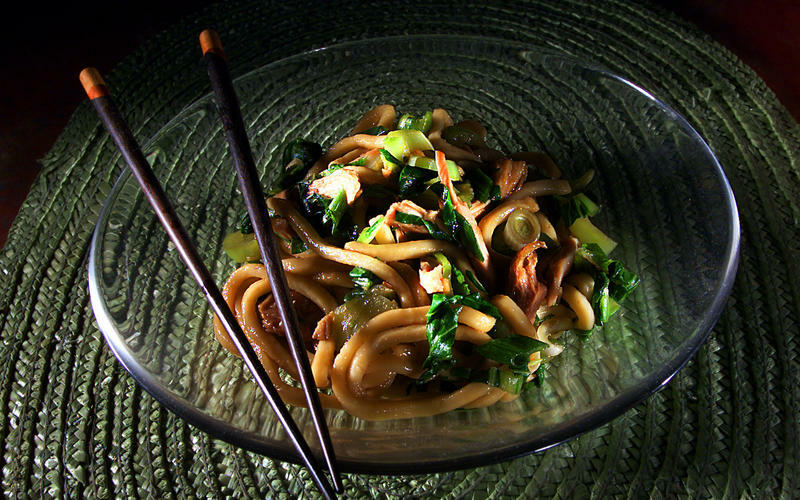 Chilled Udon With Teriyaki Chicken and Baby Bok Choy is the right choice that will satisfy all your claims.